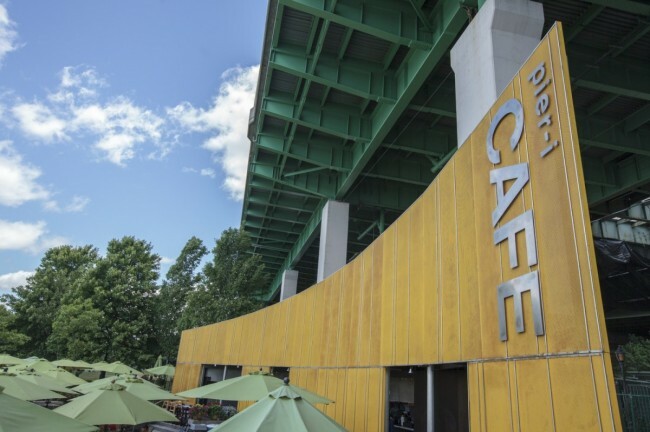 Pier i Cafe, located in Riverside Park South, offers fresh food with open air seating, scenic river views and dramatic sunsets. 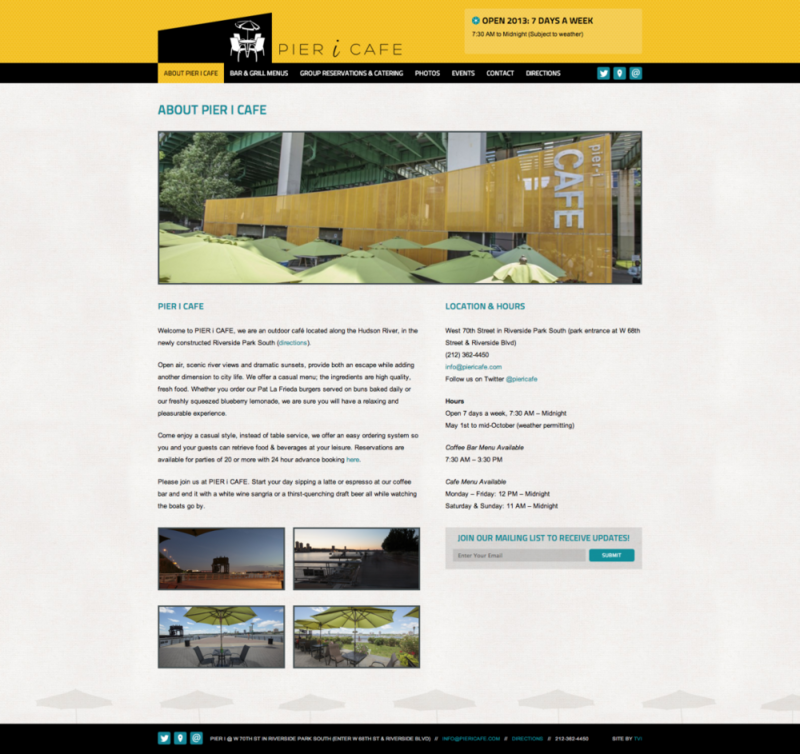 Pier i Cafe approached TVI looking to redesign their existing website. The previous site, which was part of their hosting package, was not user friendly and did not showcase the space well. The new site relies on exceptional photography and is built with a content management system so the owners can easily make updates. Pier i Cafe is an outdoor cafe that operates on Pier i in Riverside Park. Normally TVI uses the restaurant decor to help guide the feel of the website, but with no actual restaurant how do you do that? The main feature of Pier i Cafe is a huge, curved, yellow mesh wall that towers above the umbrellaed tables. We used the wall as inspiration for the main header color and texture. As a fun way to tie in all the umbrellas, we added in small umbrella shadows along the bottom of the interior pages. As an outdoor space, whether or not the space is open depends on the weather. The owners wanted a to be able to quickly and easily update the website to let their customers know if they should come on down. With the content management system Pier i Cafe can easily update if the space is open or closed, menus, and any other content on the site to keep things up to date. 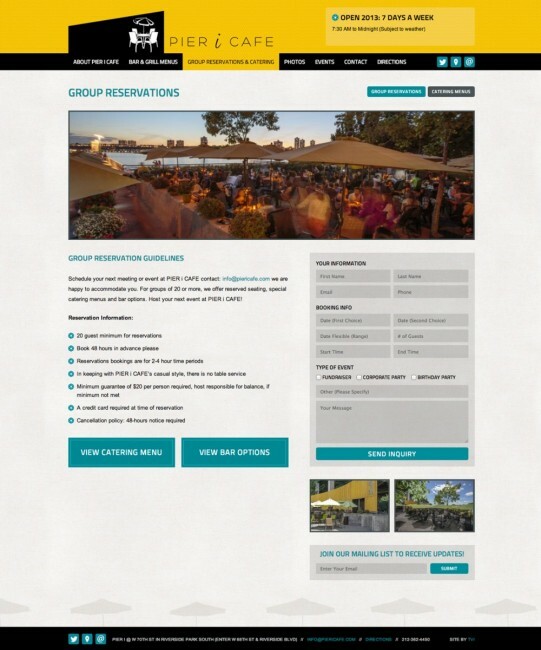 Pier i Cafe wanted to make sure their group reservations were easy to understand and book. On the Group Reservation page all of this info is laid out in easy to read bullet points, includes links to menus, and the booking form all on one place. It’s easy for both the user and Pier i Cafe to get the information they need.